The easiest way to bake a delicious glazed ham! It’s easier than you think with a delicious homemade honey, thyme glaze. We’re giving you all the details to bake your own for your next celebration. Ham 101! In my house, we bake a ham for special occasions. Usually Easter and Christmas. Even though it’s a tradition for these special celebrations, ham is actually very easy to make if you follow our tips. It’s great for the main course and works for brunch or dinner. It also looks so pretty on the plate when served with greens and a delicious honey glaze! Since we’re all about easy over here, a fully cooked, boneless ham is the best option. You can also get the fully cooked ham pre-sliced if you prefer that. Remember, a fully cooked ham doesn’t mean that you don’t bake it. You still bake a “cooked” ham in the oven before you serve. Just to be clear on that! Ham should be room temperature for 1 hour. Score the ham in a cross stitch pattern and place it on a roasting rack with the pan under to catch the juice. How to score a ham. Cover the ham in tin foil and bake it in a 350 degree oven, lower third rack for 45 minutes. After 45 minutes, add 1 cup water to the roasting pan and brush the glaze over the ham, discard the foil and bake uncovered for another 15 minutes. Brush again with glaze and bake a few more minutes until the ham is a nice golden brown! A pre-cooked 8 pound ham will take about 1 hour and 15 minutes to cook in 350 degree oven. It’s about 10 minutes per pound of ham. For this 8 pound ham we did about an hour and 15 minutes. It turned out really good! Personally, I think the glaze is the best part! 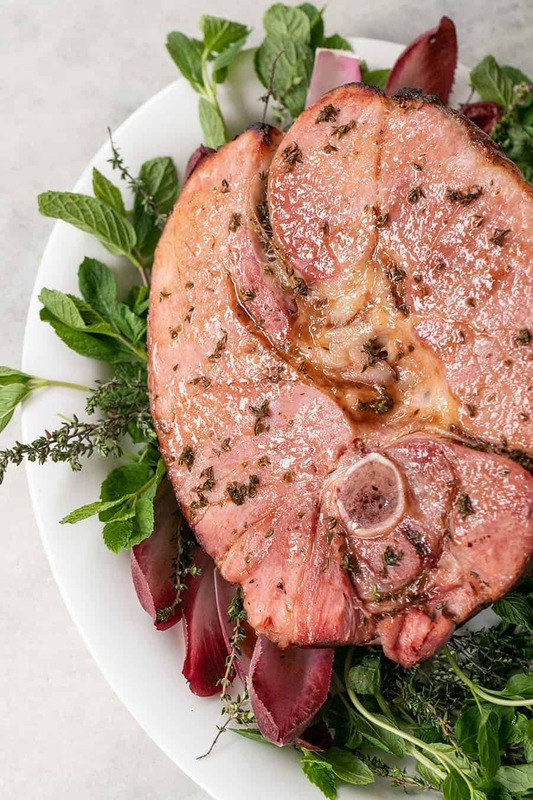 This recipe is a favorite and adds so much flavor to the ham. It’s truly the best!! It’s made with vinegar, Worcestershire sauce, salt, honey, cayenne, thyme and butter. You just whisk all of those ingredients together and let it sit in a bowl until the ham has cooked for 45 minutes. Then brush it on the ham and bake a little longer for a golden brown ham. The juice at the bottom of the pan after the ham is glazed and cooked is delicious. It’s worth pouring in a little bowl to pour over the ham slices when serving. How do you reheat a ham in the oven? If you have extra ham left over, you can wrap it in foil and place it in the fridge to be reheated the next day. To reheat the ham, just place the wrapped ham in a 325 degree oven until it reaches an internal temperature of 135 to 140 degrees. If it’s sliced, it won’t take too long to warm in the oven. That’s it! How easy is that?! Let us know if you make this ham for a celebration by leaving a comment and review! We love to see what you all make! Also, you can tag @sugarandcharm on our social channels as well. Serve it with our amazing Quiche! Rest ham for 1 hour to room temperature. Score the ham in a cross stitch pattern and place it on a roasting rack with the pan under to catch the juice. Add all of the ingredients for the honey glaze in a small bowl and whisk until incorporated. Set aside until ham has baked for 45 minutes. Add 1 cup water to the roasting pan and brush the glaze over the ham, discard the foil and bake uncovered for another 15 minutes. Make sure the ham in room temperature before you bake it. You can buy a pre-sliced ham as that tends to be easier. Thanks for the step by step process. Curious on how you lay the ham on the pan when cooking. Cut side down, on its side? Hi Heather! Great question! You can cook it on the side. There is a picture of it on the roasting rack before baked and that’s exactly how we put it in the oven.